I have to say that this wasn't originally on my 2013-2014 Birthday Bucket list, even though it has been on my global bucket list since the day I sold my house in Indiana. We were originally planning on waiting to purchase a new house until Kevin started working, but we (meaning mostly me) had reached our tolerance of living in a cramped rental house with no control over anything. I guess I'm just a nester by nature, and not being able to make our living space into my own permanent home was having a profound affect on my mental state and my ability to adjust to living in Arizona. Even after living here for 2 ½ years, I've been really struggling to feel at home. I knew the only solution was to start putting in some real roots by buying a house and settling into it, so we decided it was time. The original #28 on my list was to plan a trip post gradation and bar exam with Kevin, but buying a house meant all our savings would be used up for a while, so I decide to swap the items on my list. Moving into the house wasn't quite as smooth sailing as I had hoped, which I mentioned in last month's self-portrait post, but overall I'm beyond thrilled to be in our own house. I love the layout of the house and our backyard is too amazing for words. We've already made tons of changes to personalize the house, thanks to the help of my incredible dad who is a fix-it genius! We have a mile long list of more updates he is going to help us with this spring. The best part of the experience is that after 5 ½ years Kevin and I are finally living in a home that we picked out together, and soon we will be filling our home with furniture that we both got to choose. I can't tell you how huge this is for us! All this time we have been using things that I owned when Kevin and I met and being able to fill our new home with things that we picked out together feels like we are finally creating the life we dreamed of when we first started dating. We started looking for a house back in late October, found one we liked in late November, and moved in in late December. I took this photo a few weeks ago when I was practicing ring shots with my new lens. 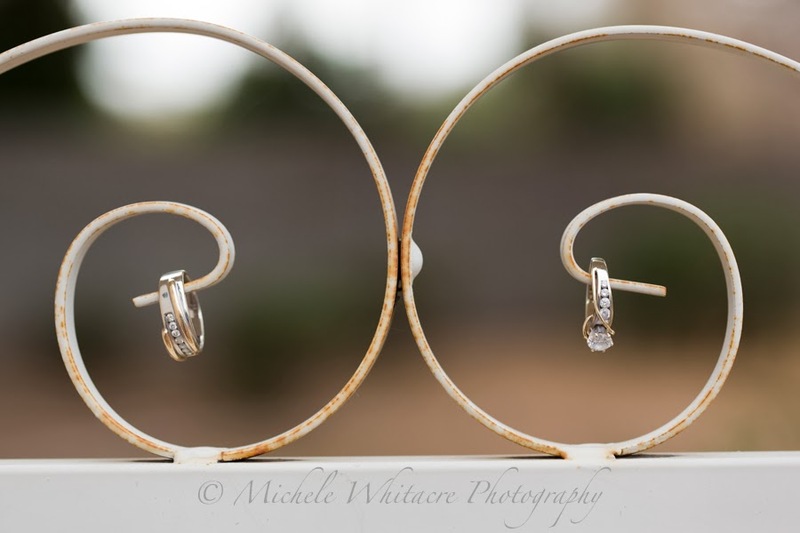 It is our rings hanging on a gate in our new backyard. I'm sure I will eventually post house photos, but for now I felt like this image was the more fitting. After all, home is where you hang your heart, right?